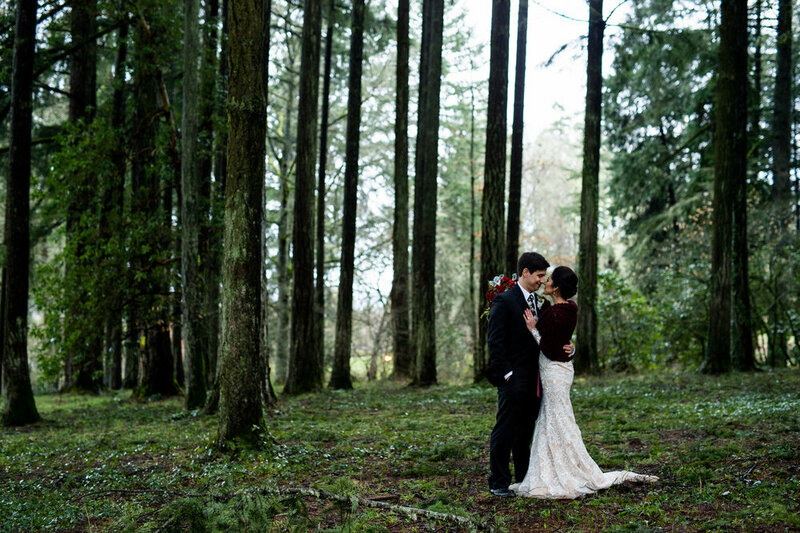 Andrew and Roxy met in Eugene, Oregan. After a year, they packed up a U-Haul and moved to Southern California. Andrew proposed to Roxy after they ran the Disney Tinkerbell half marathon. They got married back in Oregon with their families and still live in Southern California with their dog and cat. The Ring: Roxy inherited her grandmother's gorgeous heirloom ring with sapphires and emerald accent stones. Her wedding bands were custom designed to perfectly match the hand filigree work on her engagement ring. The couple picked out a stunning pair of natural pink and white diamond earrings for Roxy to wear on her wedding day. Andrew picked out a classic white gold band with a textured finish.